I’m officially excited. My personal book of the year, Shantaram by Gregory David Roberts, is about to be made into a movie. Hang on a minute—just how many books have I read in the last year? The answer to that is besides the point, as is the fact that Shantaram is some four years old now, not to mention approximately twenty years in the writing. What matter accuracy in the world of adaptation to screen? The film rights to the novel were brought by actor and embodiment of cool Johnny Depp, who narrowly beat real life Australian hard-man and wanna-be criminal Russell Crowe (he’s a Kiwi actually) in a bidding war for the story of an Australia prison escapee who found redemption in the heart of India. After making the successful bid for the movie rights to Shantaram, Johnny Depp invited me to visit him in London. Took me a nanosecond, yaar, to pack a grip and pick up the First Class ticket he left for me at the British Airways desk in Melbourne. A limo picked me up at Heathrow and dropped me at a superb boutique hotel, The Baglioni, near Kensington High Street (Oh yes, Mr. Depp is very definitely a Class Act). When I met the man himself, he was kitted out for the Willie Wonka role in Tim Burton’s refacimento of Roald Dahl’s Charlie and the Chocolate factory. He looked surreal: a crimson Valiant vision of velvet-elegance with a hint of mischief’s menace in the electronic smile (you’ll see what I mean, when the movie releases in 005). Then he shook my hand – warm, strong, painter-musician grip – and took 90 seconds to set me free in the mansion of his heart. What can I tell you? All of Johnny’s fans ( a considerable number of them have contacted me in recent weeks) will be delighted but not surprised to hear that he’s just about the nicest guy on the goddamn planet. He’s generous, considerate, modest, brave, intelligent, good-hearted, creative, funny, gentle, wise, loving, loyal, hard-working, and almost unbearably cool. Watching him work, on the set of Tim Burton’s C and the CF, was an education in itself. The total professional, Johnny puts passion and intensity into every take, and is always in the moment. No less important, it seemed to me, was the way that he brought so much affectionate communication to every other actor in each scene, and extended that warmth to every member of the crew. It was a happy, positive set, and I put that down to Johnny’s art, and his good heart, and to the sensitive brilliance of his friend, the wonderful Tim Burton. Shantaram the movie is due to released in 2008, and will be directed by Indian director Mira Nair (Monsoon Wedding). 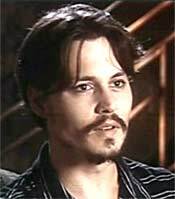 Johnny Depp, whom you just know will somehow manage to look cool in a handle-bar moustache, will star and produce. Great to see this clip John – thanks for posting it. Heard a lot of this guy and read patches of the book, but it’s nice to see him talk. – Shardul. I know I won’t have got round to reading this book by 2008 despite being very inspired (some time ago now) by your review, so I’m glad I’ve got a film to look forward to. Mira Nair and Johnny Depp (as long as he’s not putting on too strong an accent) definitely get my vote. And an outstanding quote—which leads me to… but no, I’d better stop now, and start writing my next post. I just watched this clip and thought it was excellent. I have read the book but the end did disappoint me to be honest and that kind of stuck with me. Depp was awesome as Wonka, although to truly appreciate his performance it helps if you are slightly off beam yourself I reckon. Glad to see this clip. thanks for this post. I like Depp. He was awesome as Wonka. – O-Geek. Hey thanks Ronny-O! Nice looking personal transformation blog you have there. The squirrels in Wonka were my favourite, although Depp is a long-time favourite film-star. Amazing article! Detailed and very interested. I am going to recommend this blog to my friends. My friends will find out about this amazing article! Thanks! Thanks for reading Pavitrata. I’m already getting the shakes and cravings waiting not only for the film adaptation, but parts two and three of Roberts’ life story. It does pose the question though. are the contours of our adversities shaped by our virtue?